Competition entry with Dr. Nick Dunn, Ming Chung and Nick Tyson. 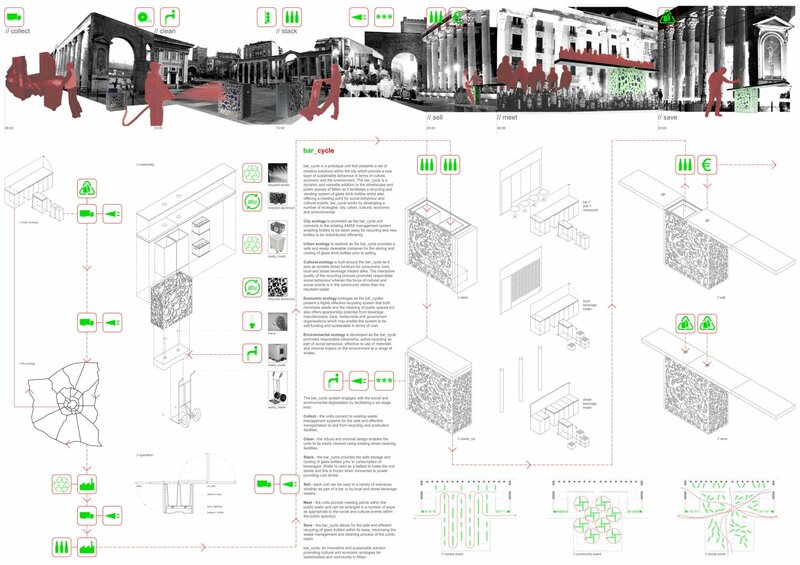 bar_cycle is a prototype unit that presents a set of creative solutions within the city which provide a new layer of sustainable behaviour in terms of culture, economy and the environment. The bar_cycle is a dynamic and versatile addition to the streetscape and public spaces of Milan as it facilitates a recycling and vending system of glass drink bottles whilst also offering a meeting point for social behaviour and cultural events. 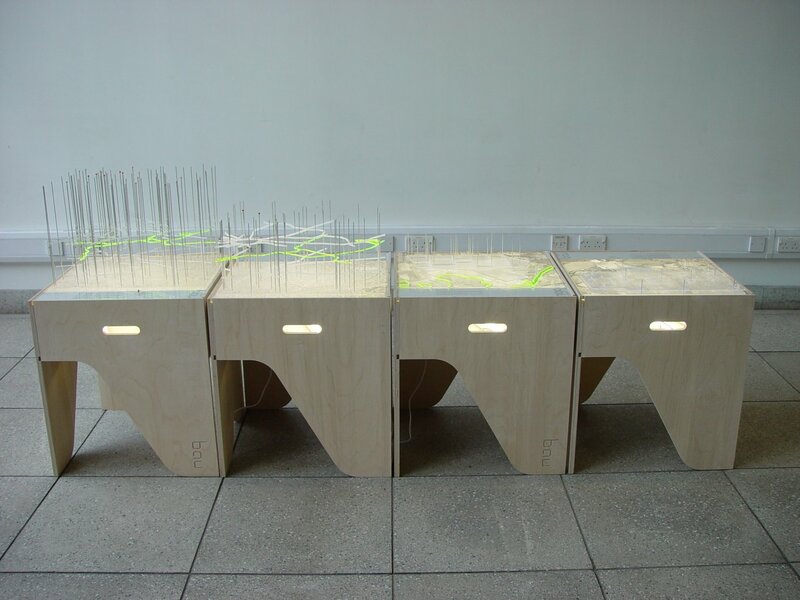 bar_cycle works by developing a number of ecologies: city, urban, cultural, economic and environmental. City ecology is promoted as the bar_cycle unit connects to the existing AMSA management system enabling bottles to be taken away for recycling and new bottles to be redistributed efficiently. 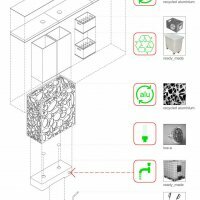 Urban ecology is realised as the bar_cycle provides a safe and easily cleanable container for the storing and cooling of glass drink bottles prior to selling. Cultural ecology is built around the bar_cycle as it acts as durable street furniture for consumers, bars, local and street beverage traders alike. The interactive quality of the recycling process promotes responsible social behaviour wherein the focus of cultural and social events is in the community rather than the resultant waste. Economic ecology emerges as the bar_cycles present a highly effective recycling system that both minimises waste and the cleaning of public spaces but also offers sponsorship potential from beverage manufacturers, bars, restaurants and government organisations which may enable the system to be self-funding and sustainable in terms of cost. 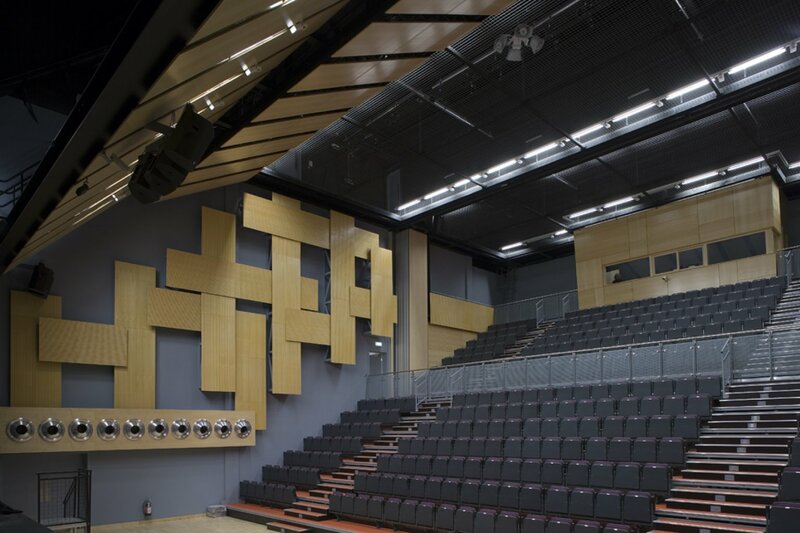 promotes responsible citizenship, active recycling as part of social behaviour, effective re-use of materials and minimal impact on the environment at a range of scales. Collect - the units connect to existing waste management systems for the safe and effective transportation to and from recycling and production facilities. Clean - the robust and minimal design enables the units to be easily cleaned using existing street cleaning facilities. Stack - the bar_cycle provides the safe storage and cooling of glass bottles prior to consumption of beverages. Water is used as a ballast to make the unit stable and this is frozen when connected to power providing cold drinks. 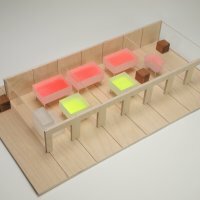 Sell - each unit can be used in a variety of scenarios whether as part of a bar or by local and street beverage traders. 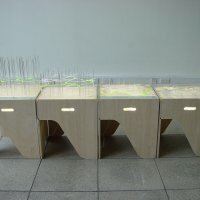 Meet - the units provide meeting points within the public realm and can be arranged in a number of ways as appropriate to the social and cultural events within the public space(s). 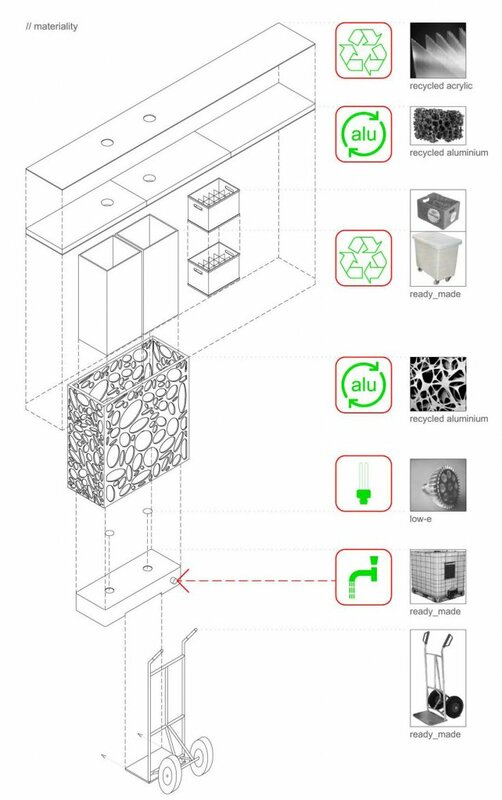 Save - the bar_cycle allows for the safe and efficient recycling of glass bottles within its base, minimising the waste management and cleaning process of the public realm. bar_cycle: an innovative and sustainable solution promoting cultural and economic ecologies for stakeholders and community in Milan. 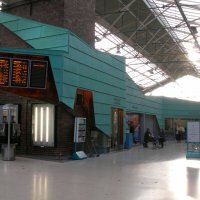 £1.5 million upgrade of existing facilities and provision of new retail, information and ticketing kiosks within existing Grade II* listed railway station. Invited exhibition at Urbis, 2001. 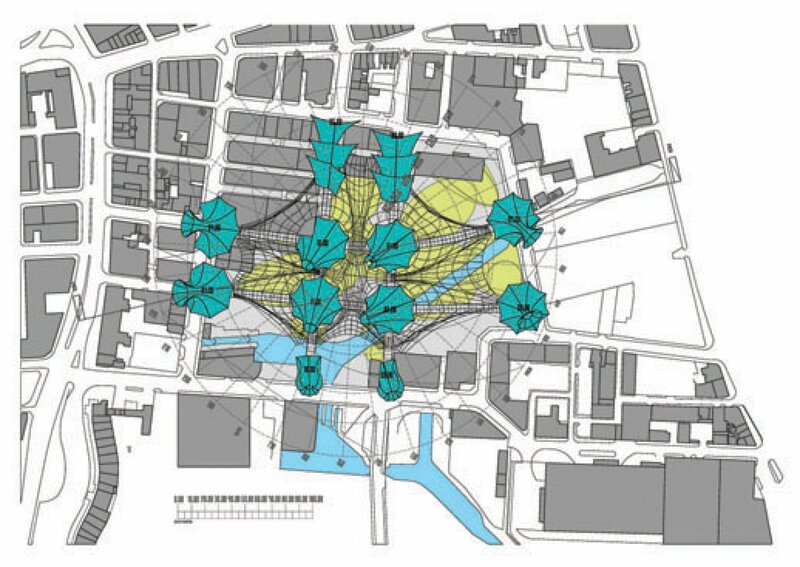 Selected participants were asked to design a sundial for deisgnated sites across Manchester. 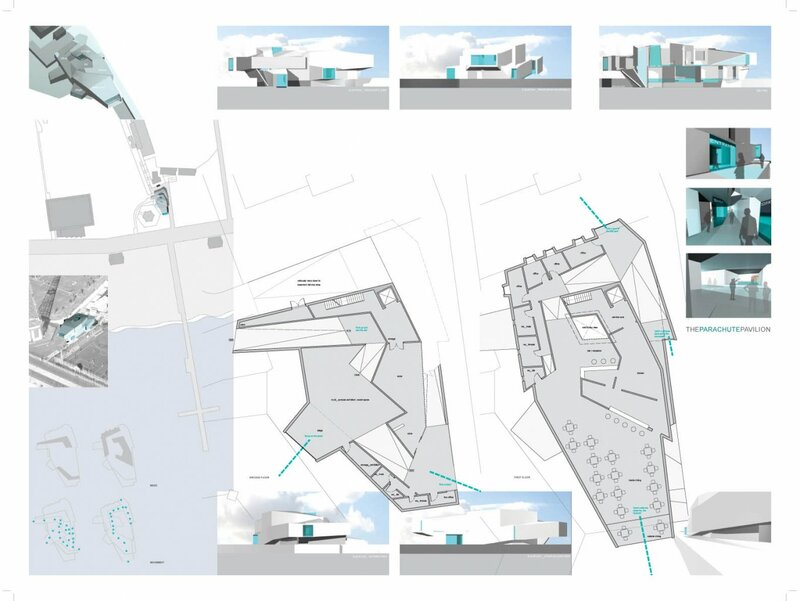 This scheme was prepared with Andrew Capewell, Andrew Bamford and Mike Cuniff for Ducie Street canal basin. The sundial was conceived as a closed system that collected energy and distributed in to 12 nodal points on a matrix that connected previously severed arteries of the urban grid. Nodes were formally expressed as 'leaves', 'fruit', 'spores' and 'parasites'. Each of these structures would be supported by a cable grid and manufactured from ETFE pillows printed with PV cells. Each pillow would be filled with a gas that would glow when heated to a low temparature fuelled by the collected energy. 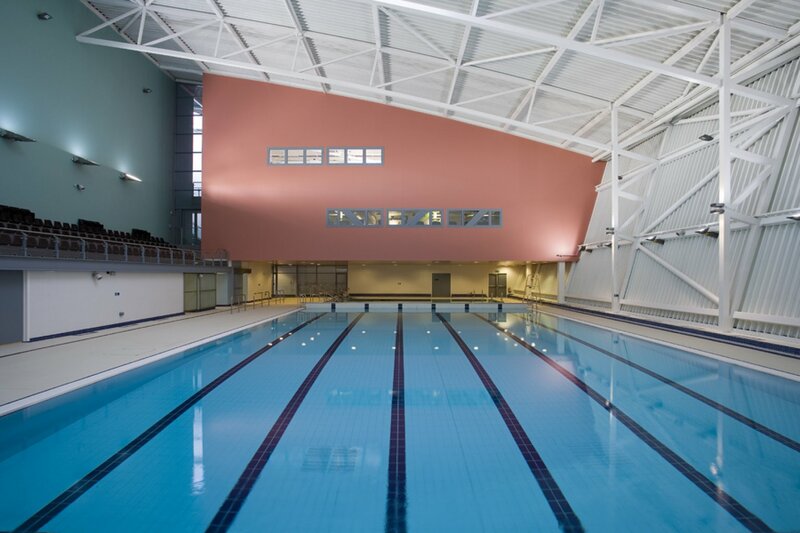 £15 million civic and leisure centre in Middleton, nr. Rochdale. 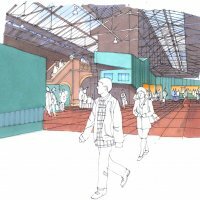 Roles: Procurement, concept design, detail design and tender stages of scheme including public realm works and wider urban masterplanning. Competition entry with Regina Huser. A new pavilion adjacent the 'Parachute' ride at Coney Island, New York. The structure is intended to address the datum between ground and boardwalk by means of a continuous sequential journey puntuated by the framing of the everyday elements of the landscape. The formal resolution was driven by the approach, defined vistas and vertical shift. The desire to consider the theme of journey and the monumental quality of normality was driven by Robert Smithson's writing and the 1979 film 'The Warriors'. Presented as a parallel component of State Legacy is an intervention and exhibition of new research-by-design work from team-bau. This project investigates the ecological issues raised as a consequence of industrialisation. 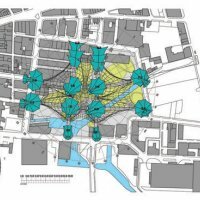 Through the analysis and synthesis of data generated by the original industrial city, Manchester is used as a vehicle to explain dynamic solutions that offer both ecological sustainability and adaptability to changing needs and future use. By communicating creative strategic proposals this continuing research project seeks to form a more cohesive perspective upon the material benefits and unwanted side effects of industrialisation. 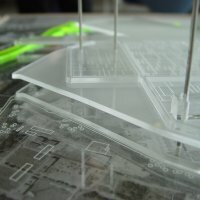 The emergent post-industrial landscape evolves through the integration of natural systems and man-made processes combined with the various levels of public interaction and events to develop an urban master-plan whose adaptability enables ecologically and culturally sustainable relationships to exist. 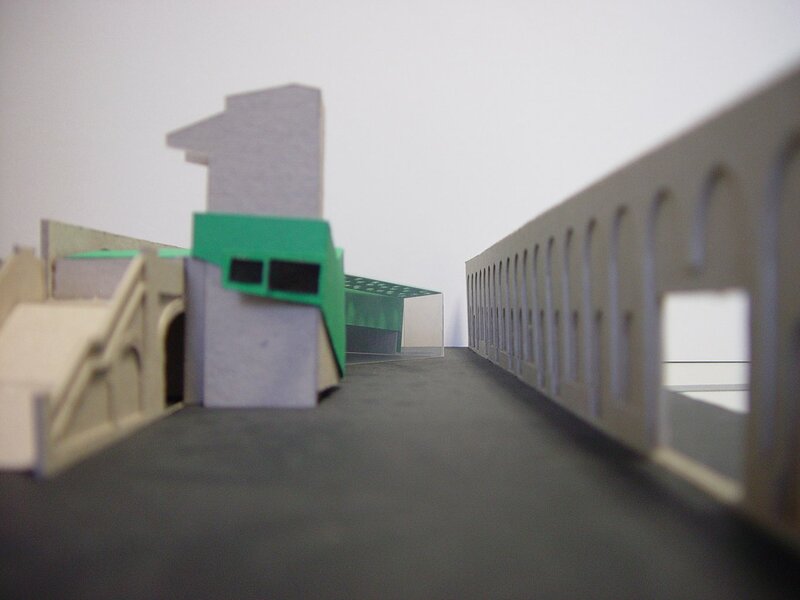 This series of 4 models ascends in scale and demonstrates the redefinition of a post-industrial landscape (car plant and power station) as a field for decontamination of household waste and ultimately a public park. The re-use and reclassification of the largely redundant regional canal network into a matrix for the collection and redistribution of sorted recyclables and waste product forms the backbone of this proposal. The mapping of existing waste processing sites (1:50000) only serves to demonstrate the reliance on the highway infrastructure to currently support these industries. Non-hazardous waste that requires some form of remediation will be treated by sorting and eventually seeded with a selection of plants suitable for the removal and filtering of toxins. The sorted recyclables will be shipped by barge to Liverpool using the Manchester Ship Canal. It is proposed that the physical elements of the waste sorting landscape (hoppers, walls, bins, gantries) will eventually be reconfigured to a leisure landscape with the passing of time as the brownfield site is cleansed and transformed into public open space. 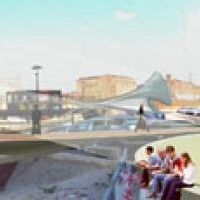 Competition submission with colleagues for urban lagoon park in Venice. "We propose a framework of interacting systems that will initiate an event landscape across the island of Sacca San Mattia and also address the wider lagoon area. We call this landscape Silt City in reference to its temporal and evolutionary nature as a result of a series of fluctuating depositions and dispersals over time. As a landscape of events, the island directly addresses the tension existing between global interest and local needs, in which tourism can coexist with the extant social conditions of Venice by providing both additional recreation for the citizens and alleviation from the current overcrowding due to tourist influx. In addition, Sacca San Mattia will act as a transportation hub for connections to other outlying areas. Landscape elements will develop incrementally over time as a result of the ecology of the recycling of refuse and the reuse of 'fields'. The fields will evolve as a result of ecological and man-made processes to establish the Urban Park's identity as users interact with the event landscape over time. 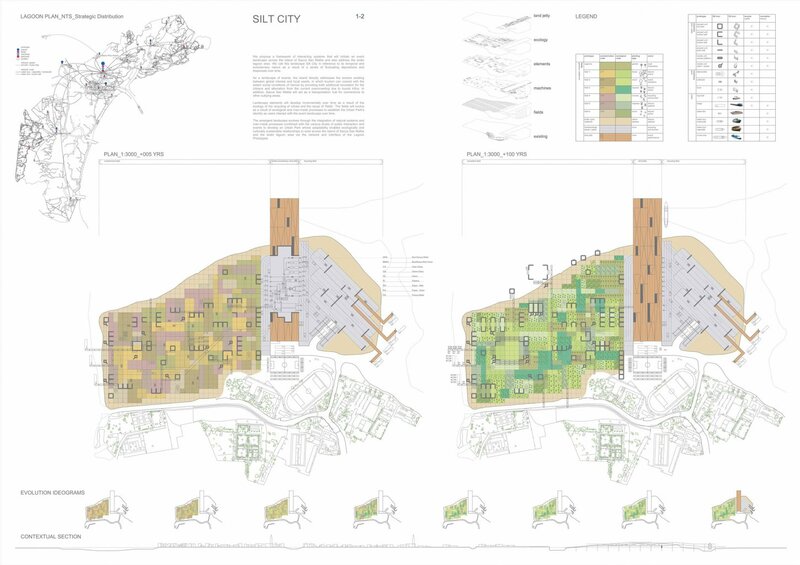 The emergent landscape evolves through the integration of natural systems and man-made processes combined with the various levels of public interaction and events to develop an Urban Park whose adaptability enables ecologically and culturally sustainable relationships to exist across the island of Sacca San Mattia and the wider lagoon area via the network and interface of the Lagoon Prototypes." Post-WWII British Modern Architecture. Infrastructure. Mapping. Functionalism. Utilitarianism. Brutalism. Industrial Architecture. Planning. Policy. Urbanism. Urban Art. Land Art. Richard is primarily interested in the policies of planning and regulation and the impact that this has on urban form, space and materiality. This interest informs two distinct areas of research; historical and contemporary. The historical research with which Richard is engaged concerns the late twentieth century and is focused on regional development in relation to national and local policy. Of particular interest within the realm of contemporary regulations are issues of territory, boundary and the demarcation and ownership of space. 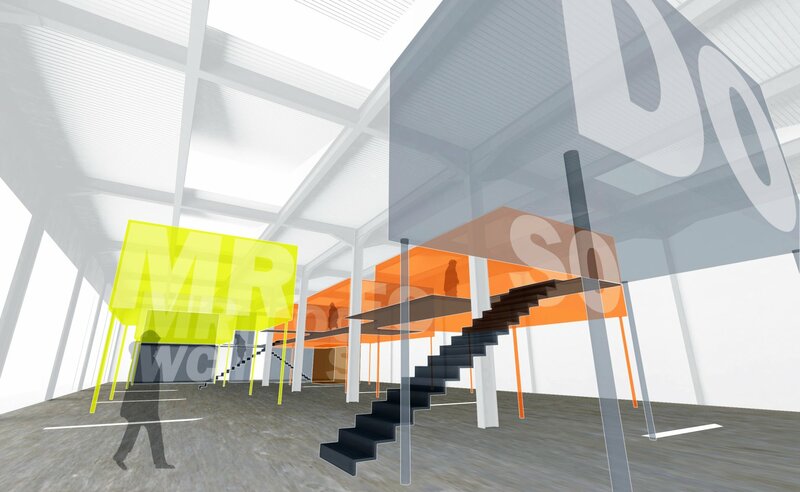 The tension between virtual (data) space and real (physical) space is paramount to these studies. 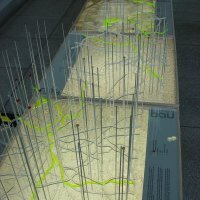 Mapping and visualisation techniques are used to provide representations of urban space which utilise the exposition of latent political and numerical conditions as both reactive and predictive models. 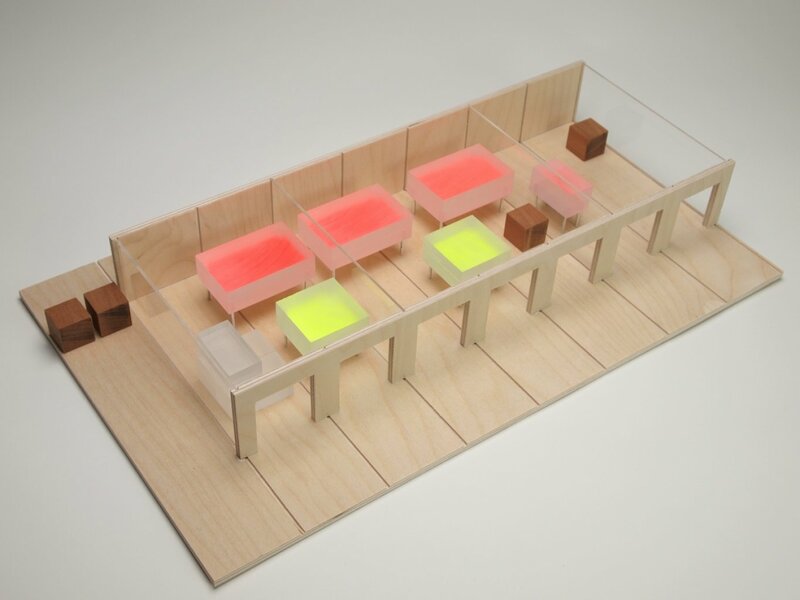 Richard is interested in the architecture of modernity, the machine age and functionalism. This is reflected in his engagement with digital media, he has worked with other artists exhibiting experimental industrial and electronic audio-visual material across the UK and Europe. Brook, R., 2018. Drawing the Modern: The work of Gordon Hodkinson and post-war architectural education in Manchester, Special Collections Gallery, Manchester Metropolitan University, 10/9/2018 - 5/4/2019. Brook, R., 2016. Making Post-War Manchester: Visions of an Unmade City, Manchester Technology Centre, 3/6/2016 - 24/6/2016. Millington, S., Hale, J., Steele, M., Brook, R., 2014. Sci.Eng.50, Grosvenor Gallery Annex, 23/10/2014 - 21/11/2014. Brook, R., 2012. Infra_MANC. Post-war Mancunian Infrastructures, CUBE Gallery & RIBA Hub. Manchester, 24/2/2012 - 23/3/2012. Dunn, N. and Brook, R., 2009. Shaping the Future: Heritage Open Days, Town Hall, Barrow-in-Furness, Cumbria, 10-13 September 2009.
team-bau, 2009. State Legacy, Cornerhouse and Grosvenor Gallery, Manchester, 2nd April - 8th May 2009. Brook, R., 2018. 'Cwmbran (From the Archives)', The Modernist Society, Manchester. Brook, R., 2018. 'Hulme (From the Archives)', The Modernist Society. Brook, R., 2018. 'Hyde Park (From the Archives)', The Modernist Society. Brook, R., 2018. 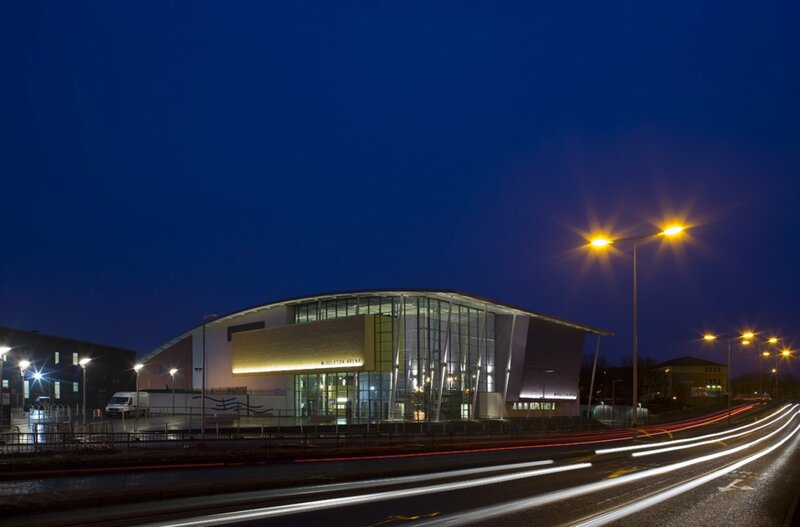 'Peterlee (From the Archives)', The Modernist Society. Brook, R., 2018. 'Runcorn (From the Archives)', The Modernist Society. Brook, R., 2018. 'Skelmersdale (From the Archives)', The Modernist Society. Brook, R., 2017. 'Manchester Modern', The Modernist Society. Brook, R., Dunn, N., 2013. 'Urban Maps Instruments of Narrative and Interpretation in the City', Ashgate Publishing, Ltd..
Brook, R., Dodge, M., 2012. 'Infra_MANC Post-war Infrastructures of Manchester : the Catalogue of Infra_MANC. An Exhibition at the RIBA Hub/CUBE Gallery, Portland Street Manchester from 27th February - 17th March 2012'. Brook, R. and Dodge, M., 2012. 'Infra_MANC. Post-war Mancunian Infrastructures', bauprint: Manchester. Brook, R. and Dunn, N., 2009. 'Isolative Urbanism: an ecology of control', bauprint. Mills, G., Fitzpatrick, J., Chadwick D., O'Donnell, C., Islam A., Ellis D., Brown F.,, 2001. 'Manchester Architecture Papers', The Manchester School of Architecture. Brook, R., 2018. 'Belgrade'. In Rhead, E., Hale, J. (eds.) Adventures in the Land of Modernism, pp. 78-90, The Modernist Society. Brook, R., 2016. 'Mainstream Modern'. In Neate, H., Craggs, R. (eds.) Modern Futures, Uniformbooks. Brook, R., Dunn, N., 2009. 'The Control of Space: mediating fear in the urban condition'. In Isolative Urbanism, bauprint, Manchester. Brook, R., 2008. 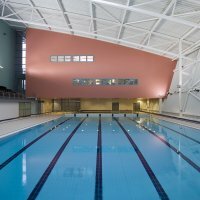 'Learning Lessons: Post-war architecture of the universities'. In Manchester School of Architecture (eds.) MSA2 Yearbook 2008, 33-36, MSA. Brook, R., 2010. 'Manchester Modern: The Shape of the City'. Brook, R., 2014. 'Helicopter dreaming: the unrealised plans for city centre heliports in the post-war period', http://www.bcu.ac.uk/Download/Asset/f196b924-0666-4194-b34c-e2388e71463a. Brook, R., 2014. 'Trying to close the loop: post-war ring roads in Manchester', http://www.bcu.ac.uk/Download/Asset/cd53b53d-be5a-49c8-aea0-ab0d9182b635. Brook, R., 2009. 'The Hollaway Wall', http://www.c20society.org.uk/botm/hollaway-wall-manchester/. Brook, R., 2018. 'Roger Booth, Lancashire County Architect, 1962-83. ', The Journal of the Twentieth Century Society (C20), 13, pp. 130-145. Brook, R., 2018. 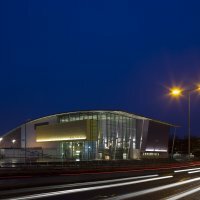 'The National Computing Centre - White Heat, False Logic', Journal of the Society of Architectural Historians. Brook, R., Dodge, M., 2014. 'Dreams of Helicopter Travel in the 1950s and Liverpool's Undeveloped Plans for a City Centre Heliport', Transactions of the Historic Society of Lancashire and Cheshire, 163, pp. 111-125. Brook, R., Dodge, M., 2014. 'The Guardian Underground Telephone Exchange', Lancashire & Cheshire Antiquarian Society Transactions, 108, pp. 20-55. Brook, R., 2012. 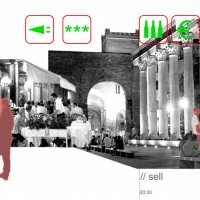 'Building as Sign: Architecture in the Image Economy', The International Journal of the Image, 1 (4), pp. 67-82. Brook, R., 2018. 'Parts of a whole. Peter Womersley - the elements and unity of the Nuffield Transplantation Surgery Unit. ', The Modernist, 26, pp. 42-47. Brook, R., 2016. 'Concrete Junglists', The Modernist, 20, pp. 18-21. Brook, R., 2015. 'Cold War Concrete: Engineering the Airwaves', The Modernist, 14, pp. 30-33. Brook, R., 2014. 'Expo[sed]', The Modernist, 13, pp. 32-37. Brook, R., 2014. 'Mancunian Way', Architektur in Gebrauch, 3, pp. 3-8. Brook, R., 2013. 'For all the right reasons', The Modernist, 8, pp. 16-19. Brook, R., 2013. 'From Bold to Belligerent', The Modernist, 9, pp. 24-25. Brook, R., 2012. 'Police Brutality', The Modernist, 4, pp. 12-15. Brook, R., 2011. 'A Hidden Chapel', Greater Manchester Churches Preservation Society, Winter 2011/12, pp. 9-9. Brook, R., 2011. 'Boldly Gone', The Modernist, pp. 10-11. Brook, R., 2011. 'Hard Brilliance', The Modernist, 2, pp. 14-15. Brook, R., 2011. 'Manchester', C20 The magazine of the Twentieth Century Society, Autumn 2011, pp. 18-19. Brook, R., 2011. 'Manchester Chapels', C20 The Magazine of the Twentieth Century Society, Spring 2011. Brook, R., 2009. 'Church Ceramics', Glazed Expressions, pp. 16-17. Brook, R., 2009. 'Post-war Academic Buildings in Manchester', A. Architecture and Built Environment, pp. 16-23. Brook, R., 2009. 'Underley Hall Chapel, Kirkby Lonsdale', C20 The Magazine of the Twentieth Century Society, Autumn 2009, pp. 17-17. Brook, R., 2008. 'St. Augustine's Church, Manchester', The Magazine of the Twentieth Century Society, Spring 2008, pp. 12-12. Brook, R., 2019. 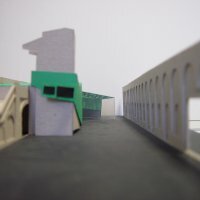 'Scammonden: Landscape Co-production in the Motorway Age', The Landscape and Architecture of Post-War British Infrastructure, Manchester School of Art, 15/2/2019 - 15/2/2019. Brook, R., 2018. 'Infrastructure as object and producer', SHU Space & Place conference - Investigating Infrastructure, Sheffield Hallam University, 13/6/2018 - 13/6/2018. Brook, R., 2017. 'Regionality: agency and authorship in architecture. 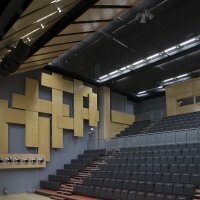 The story of the National Computing Centre - White Heat, False Logic. ', SAHGB Annual Symposium 2017 Beyond 'By': Towards an inclusive architectural history, London School of Economics, 3/6/2017 - 3/6/2017. Brook, R., 2016. 'Roger Booth, Lancashire County Architect, 1962-83', Society of Architectural Historians of Great Britain, 2016 Annual Symposium, The Official Architect; missing chapters in the history of the profession, RIBA, Portland Place, London, 21/5/2016 - 21/5/2016. Brook, R., Dunn, N., 2014. 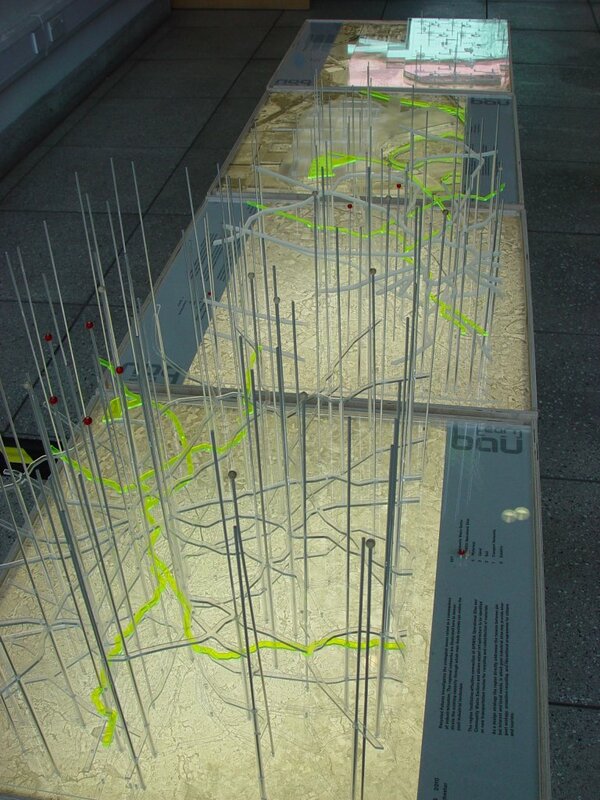 'Between planning and network, the evolution of infrastructural architecture', RGS IBG Annual International Conference 2014, Royal Geographic Society, London, 26/8/2014 - 29/8/2014. Brook, R., Jefferies, T., 2013. 'It's Just Juxtabridity', Association of American Geographers, Los Angeles, 9/4/2013 - 13/4/2013. Brook, R., 2013. 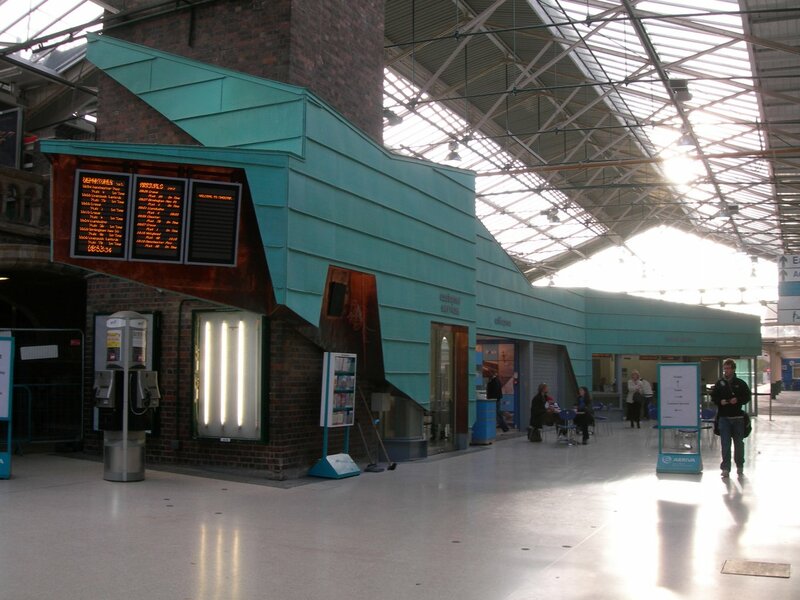 'Renewal and Regionality: Cruickshank and Seward in Manchester', The Transformation of Urban Britain Since 1945, University of Leicester, Centre for Urban History, 9/7/2013 - 10/7/2013. Brook, R., 2019. 'The Mancunian Way: techno-cultures of the post war', Bartlett, University College London. Brook, R., 2019. 'The Mancunian Way: techno-cultures of the post war', Bartlett School of Architecture, University College London. Brook, R., Tan, K., Benjamin, E., 2018. 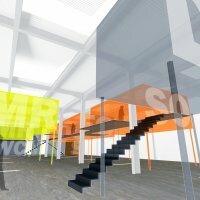 'Immersive Experiences: The Life of Buildings', College Court, Leicester. Brook, R., 2017. 'Drawing the Modern: A viewing of the student work of Gordon Hodkinson', MMU Special Collections. Brook, R., Dunn, N., 2017. 'Warp & Weft: Infrastructural Architecture and Volumetric Urbanism', The Chimney House, Kelham Island, Sheffield. Brook, R., 2016. 'Grand Plans: Campus, Precinct and Parkland', Historical Geographies of Higher Education in Greater Manchester, Manchester Meeting Place, North Campus, University of Manchester, 9 November 2016. Brook, R., 2016. 'Roger Booth. Lancashire County Architect, 1962-83. ', Society of Architectural Historians of Great Britain, Annual Symposium, RIBA, Portland Place, London, 21 May 2016. Brook, R., 2016. 'Visions of the Unmade City', Building Design Partnership, Ducie Street, Manchester. Brook, R., Dodge, M., 2015. 'Cold War Urbanism: Histories of strategic plans, secure structures and technocratic politics', International Conference of Historical Geographers, Royal Geographic Society. Brook, R. & Dunn, N., 2014. 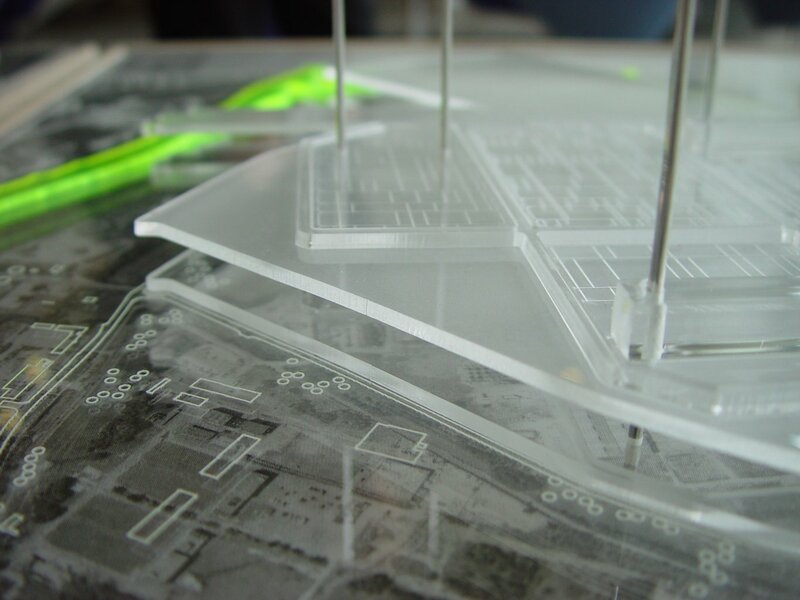 'Between planning and network, the evolution of infrastructural architecture', RGS IBG Annual International Conference 2014, Royal Geographical Society, London, 26-29 August 2014. Brook, R., 2014. 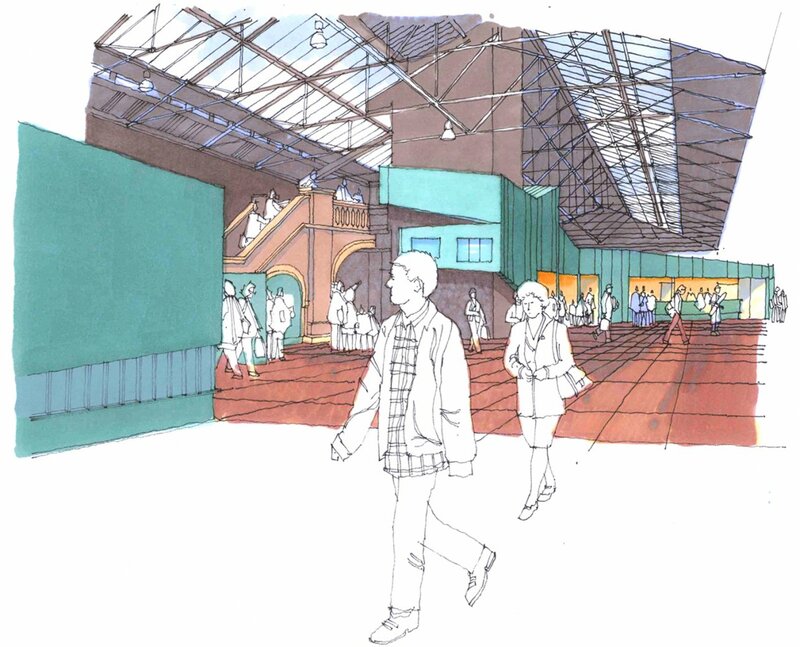 'Masterplanning Mobility: Mancunian Methods', Museum of Science and Industry, Manchester. Brook, R., 2014. 'Oxford Road: the promise, planning and problems - Masterplanning progress: Technology, teaching and architecture', Central Reference Library, Manchester. Brook, R. & Dodge, M., 2014. Brook, R., 2013. 'Manchester. The 59 year history of the inner relief route', Infrastructure and the rebuilt post-war city, Birmingham City University, 25 March 2013. Brook, R., 2013. 'Manchester: Disconnected City', The making of post-war Manchester 1945-74: Plans and Projects, University of Manchester, 8 May 2013. Brook, R., 2013. 'Renewal and Regionality: Cruickshank and Seward in Manchester', The Transformation of Urban Britain Since 1945, University of Leicester, Centre for Urban History, 9 - 10 July 2013. Brook, R., 2013. 'The materiality of entropy: an application of order', Time, Space and the Body, Mercure Hotel, Sydney, AU., 11-13 February 2013. Brook, R. and Dunn, N., 2011. 'Data Mining: Abstract Urban Topographies', Royal Geographical Society Annual International Conference 2011: The Geographical Imagination, Royal Geographical Society and Imperial College, London, 31 August - 2 September 2011. Brook, R., 2009. 'Manchester Modern - Planning Policy & the Shape of the City', 20th Century Society NW Lecture, Manchester, 7th October 2009. Brook, R., 2009. 'Modern Architecture + Planning in Manchester', American Institute of Architects UK: Urban Regeneration, Urbis, Manchester, UK, 23.04.09-26.04.09. Dunn, N. and Brook, R., 2009. 'The City and The Control of Space', Metropolitan Desires: Cultural Reconfigurations of the European City Space, Manchester Metropolitan University, 8-9 September 2009. Brook, R., Chung, M., Dunn, N., Tyson, T., 2011. 'Emerge: Spatial Design Report', Commissioned report into formal design solutions for east Manchester recycling cooperative. Brook, R., 2011. 'Manchester Modern', A curated set of photos for GMCRO from the Manchester Local Image Collection. Dunn, N. and Brook, R., 2011. 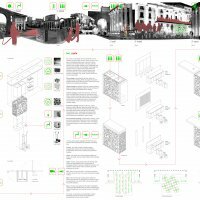 '[Re_Map]: the image of the urban landscape', Co-chaired conference session at the Royal Geographical Society Annual International Conference 2011: The Geographical Imagination. Brook, R., 2010. 'Manchester Modern: The Shape of the City', Thesis submitted to the RIBA Library..
Tyson, N., Brook, R., Chung, M., & Dunn, N., 2009. 'Design Briefing Report for EMERGE Recycling Manchester'.